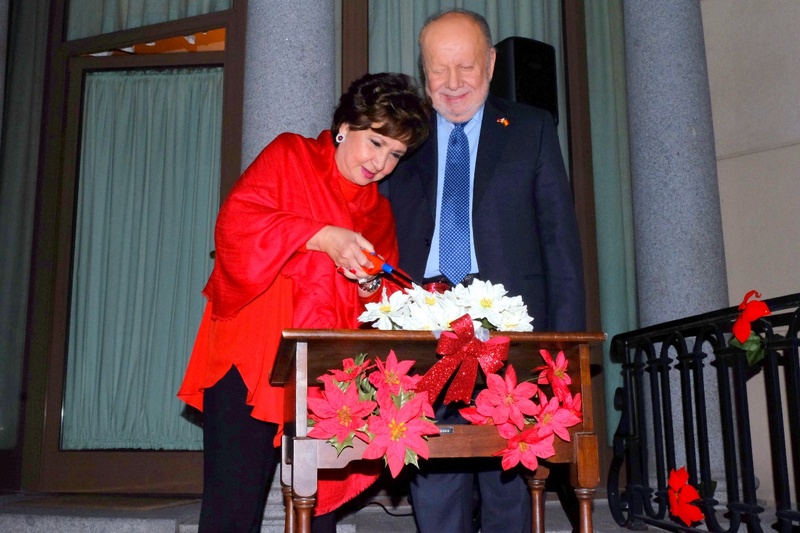 Madame Edna D. Lhuillier, assisted by Ambassador Philippe J. Lhuillier, lights the Christmas candle during the ceremony held at the Embassy last November 18. The world famous Philippine Christmas lanterns (or parols) illuminated the Philippine Embassy compound in Madrid during the official Christmas lighting ceremony held on 18 November 2017. The lighting was Madrid PE´s way of officially kicking off the Filipino Christmas celebration in Spain. For the first time in the history of the Philippine Embassy in Madrid, twenty (20) colorful Christmas lanterns from Pampanga and several capiz-covered lights twinkled as Ambassador and Madame Philippe J. Lhuillier lighted the Christmas candle which symbolizes peace, hope and prosperity. Simultaneously, Philippine traditional Christmas carols played in the background. Ambassador Lhuillier thanked his Embassy family for the hard work and cooperation they have been extending, and encouraged everyone to soar even higher in 2018. Like the beautiful lights of the Pampanga parol working in unison and in perfect coordination, he emphasized the importance of working together towards achieving the goals of the Embassy, of the Department and of the government as a whole. The Ambassador challenged everyone to work together for bigger, brighter and more successful programs and activities for the Embassy in 2018. Madame Edna D. Lhuillier, for her part, also thanked the Embassy personnel for their support and wished everyone more success in the coming year. Later in the night, the Embassy personnel surprised Ambassador and Madame Lhuillier with a singing of Filipino Christmas carols. The display of the Filipino parol and different capiz lights not only marked the beginning of Christmas as traditionally celebrated in the Philippines, but also showcased the crafts, talents and creativity of Filipinos as these world famous lanterns attract attention and praises from passersby. The dynamic promotion of Philippine culture, expansion of trade, economic and tourism exchanges, are the some of the core areas which the Embassy aims to intensify in the next two years. The Christmas lanterns will continue to light the Embassy from 6:30 pm to 9:30pm until 06 January 2018, the feast of Epiphany in Spain.